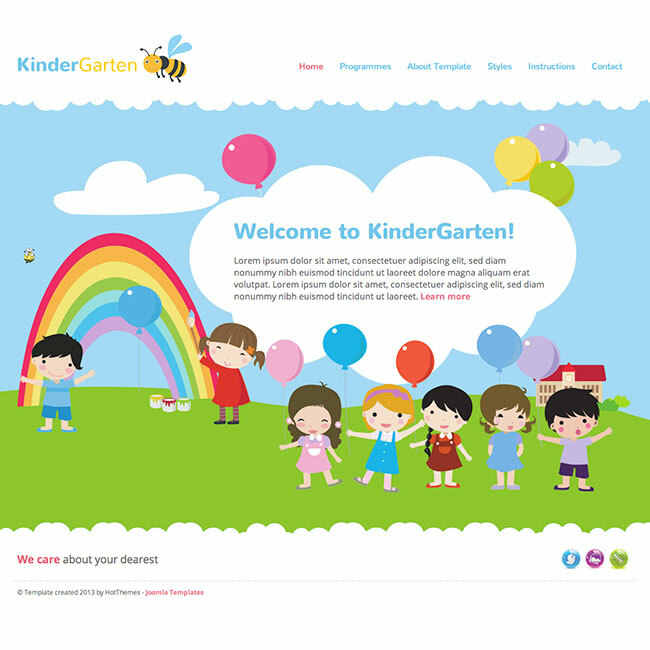 This is a funny Kindergarten template filled with graphics and CSS3 animations appropriate for kindergartens and similar subjects that offer babysitting services. These could be babysitting agencies or restaurants for kids and birthday celebrations. This template has an intro page with a big image made of vector graphic. As you can see (in all modern browsers, such as Chrome, Firefox, and IE10+) this is not a static image. Some objects, such as balloons and bees are rotating here and there and flying up to the skies. All these animations are made with CSS3 and they are playing only on the modern browsers. In older browsers, visitors can see static images. There are also interactive rollover animations on the logo, social buttons and read more buttons, powered by CSS3 as well. The inner pages are in a similar style. There are big cloudy headers that are different for different sections of the site. 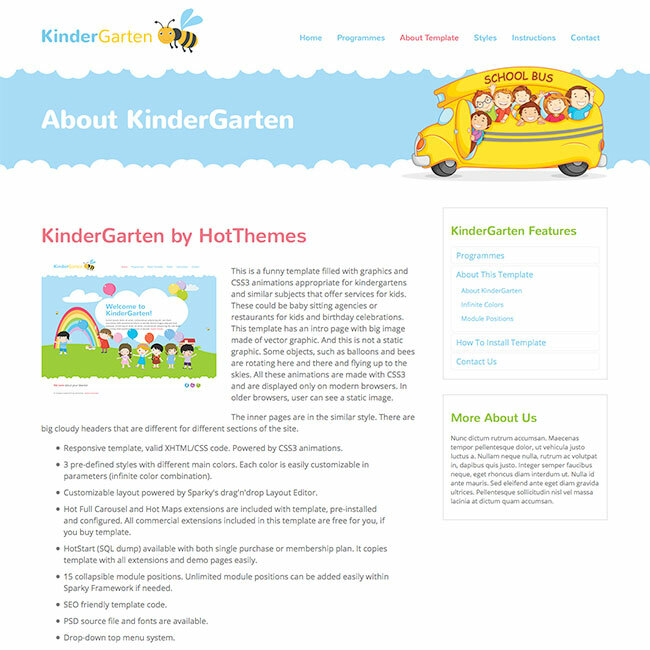 Kindergarten template has been powered by the latest version of the responsive Sparky Framework. This means that you can modify this template easily and without programming skills. 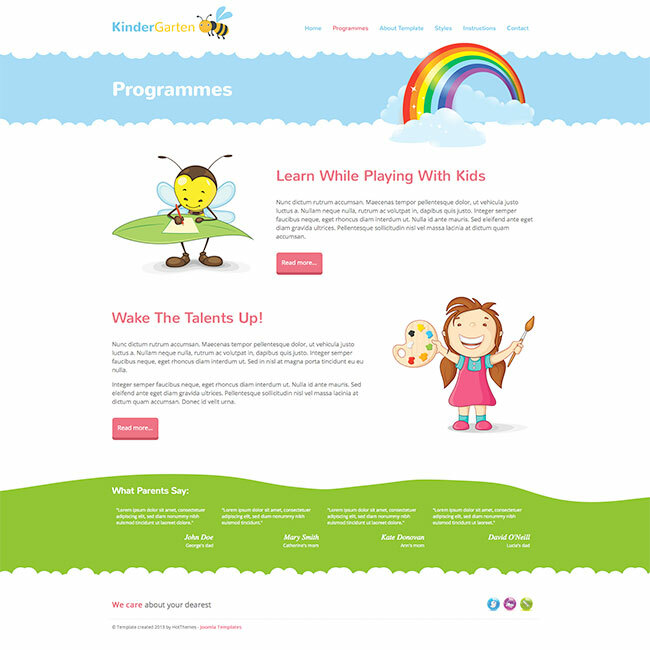 Responsive template, valid XHTML/CSS code revived with CSS3 animations. 3 pre-defined styles with different main colors. Each color is easily customizable in parameters (infinite color combination). Customizable layout powered by Sparky's drag'n'drop Layout Editor. Hot Full Carousel and Hot Maps extensions are included with template, pre-installed and configured. All commercial extensions included in this template are free for you, if you buy template. 15 collapsible module positions. Unlimited module positions can be added easily within Sparky Framework, if needed.